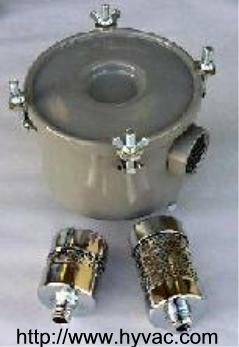 Exhaust filters are often used on oil sealed rotary vane vacuum pumps. 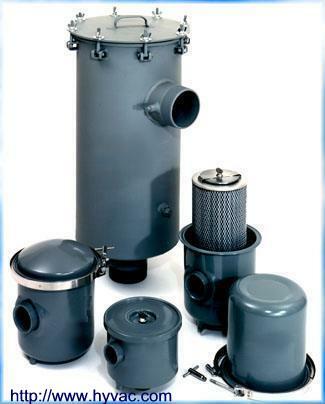 The main reason to use an exhaust filter is to eliminate or minimize oil mist that can often be a byproduct of the vacuum pumps operation. Oil mist is often generated by vacuum pumps for a variety of reasons. The most prevalent and common cause is operating the vacuum pump at "high" pressures. Generally speaking operating pressures above 1 Torr or 1000 micron can cause oil mist to be apparent. Oil mist creation is not unusual and "No the pump isn't on fire." The most common cause is operating the pump by pumping against an "open" or leaky system. The pump then has very high gas flows going through it, and in the process will atomize oil molecules (aerosol) and they will then attempt to exit the pump and, baring no filter media to prevent this, they will. If you received an exhaust dome on one of our vacuum pumps, this is not really a substitute for a true exhaust filter. An exhaust dome keeps dirt and particulates from getting into your pumps' exhaust port and then into the oil. It is a very rudimentary filter, and sometimes just a mesh screen. An exhaust filter or "oil mist eliminator" is a more advanced filter usually containing a replaceable element that will stop oil mist on a molecular basis or at least make a good effort at it. Exhaust (oil mist) discharge can be cut significantly by adding one of these filter items to your vacuum pump. Not only does it keep the oil mist out of your workspace; it also will keep the pump oil in the pump where it belongs. There are two basic types and numerous variations in these two categories. The first is a standard exhaust filter; generally coalescing, that will trap most of the oil mist, keep the oil in the pump and exhaust into the workplace. Coalescing means that the oil drains back into the pump after it condenses on the insides of the filter element itself. The second type of exhaust filter does the same as the first, but also includes an exhaust port from the exhaust filter. We call this a capture filter. With this filter a hose can be hooked up to the filters exhaust port and any oil mist that gets by the element can be directed via hose connection to a hood to remove from the workplace. 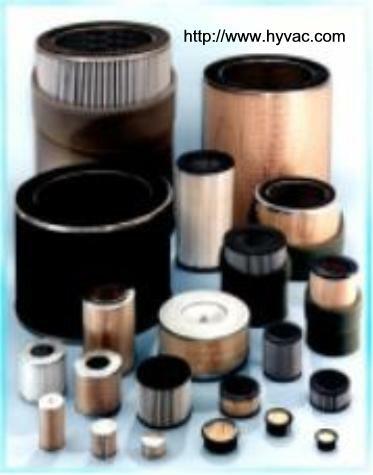 HyVac Filter elements have been designed to 99.999% DOP efficiency on .2 micron diameter particles. They are rated at 5 parts per million at 60 Torr maximum carryover. 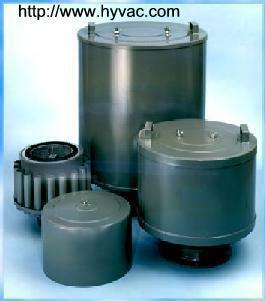 Oil mist filters are designed for oil mist, pretty large molecules. If you are dealing with volatile solvents or other types of work place unfriendly items then the second type of exhaust filter is the filter for you. These types of filters usually entail a little more installation cost due to need to run hoses from pump exhaust to the hood but because they present a closed loop to the hood for exhaust the user is assured a clean environment. Filters will require changing from time to time and the frequency depends on the amount of use the filter element in the filter gets. A simple maintenance program can be put in place once the frequency of actual changes needed becomes apparent. If a filter is allowed to operate after being all clogged up over time, then back pressure may start to develop in your pump and may put undo pressure on the shaft seals or other exit ports from the pump itself. The motor will also tend to work harder in this situation, so it is important to replace the element every 6 months or so. Again it really depends on the amount of use the system gets. Filter change out generally should occur when there is a pressure differential of 2.5 psid across the filter. 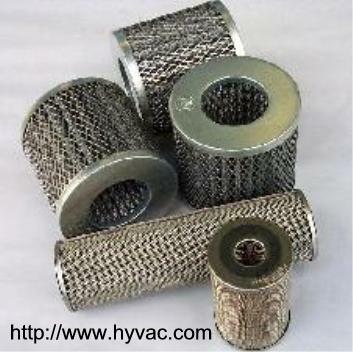 All of the exhaust filters from HyVac are very easy to install and either thread into the exhaust port of the pump or can be clamped on in some relatively simple manner. Do I really need this thing? Depending on what you are pumping out of your system a good exhaust filter, with a port to a hood may be a prudent investment. Your pump has less of a chance of running out of oil with this type of item in place. There is less exposure for local personnel to the exhaust by products and vapor streams from the pump. It is feasible to port the exhaust directly to a hood, but then monitoring of the pumps oil level should be made a routine preventative maintenance practice. Take care to avoid any low spots in the exhaust line as oil may collect there and again cause back pressure during operation. Other causes besides external leaks and operating the pump open to atmosphere are what are known as virtual leaks. If the pumps exhaust valves are not working correctly then excess oil mist may also appear in this manner. To check if this is the problem, disconnect your pump and place a rubber stopper in the intake port and turn the pump on. If the pump goes gurgle, gurgle and quiets right down this is how it should sound. Try actuating and making sure the gas ballast valve (knob on top of the pump) is seated in the down position. If instead, after playing with the rubber stopper for a couple minutes, the gurgling has not gone away, then it is best to give us a call. The two types below show regular exhaust filters which vent to atmosphere at your using location and capture filters which have threaded fittings to allow the capture of exhaust stream from the filter itself. It is then possible to port this stream to a hood or out of the building. We have many other types really too numerous to mention. QF/NW/ISO standard adaptations. Most in some kind of threaded connection. If you need one, call us with the following information and we can help you out. How you want to hook to your pump, threads or quick release fittings? Can you measure the length of element? Can you measure the (OD) diameter of Element? How the ends are prepared, rubber seals or just metal. Please be prepared to talk about your system.